I’d like to take the time to thank a few people for the opportunity to purchase this new 2008 Honda Civic Hybrid with the income I generate with blogging. I will start off with a big thanks to Rob Gale of A Welsh View, who introduced me to the world of monetizing my blog with Google AdSense. Next, I would like to thank Mike Wilson, VP Business Development of PriceGrabber.com, who took a chance by allowing a small blogger, me, the opportunity to join their affiliate program even though I did not meet the number of hits they required, (1MM+ per month). And of course I would like to thank my beautiful wife, Lisa, who allows me to spend a significant amount of time to blog. My grandmother passed away yesterday (5/9/07) at the age of 92. So, I will be in Maryland for a while for her funeral and will start posting again in about a week. Nanny was able to live a full life and will be missed by all. Nanny fact: she got her first driver's license after the age of 65. Here's a picture of Nanny on her 92nd Birthday. 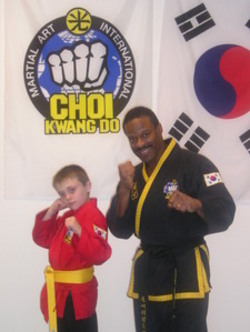 This weekend I'm taking my son (the 9-yr-old in picture on right) to the Choi Kwang Do Maritial Art 20-year Anniverary Seminar/Festival at the Cobb Galleria, in Atlanta GA.
Before you make you next Purchase plese visit my comparison shopping page and save yourself money! Welcome to the Must have GIZMOS Holiday Cost-Saving Gift Guide! We know as well as anyone what an insane mess it is shopping for Christmas gifts for your friends and family this time of year, so we're going to do our best to simplify the process. Each day throughout November and December we will post examples of savings and that you can experience by buying online using our Price Comparison Shopping service. So, visit often and compare the prices before you buy, and happy holidays! Over the past year I have written about many gadget related products and services. These have been totally unbiased reviews and even though in the most part I have commended the product I am writing about, I haven’t been shy to say some disapproving comments or suggestions for improvements. Sometimes I will attend a consumer electronic trade show and come across some really amazing products I want to share with you. Yes I also receive free products or services in a payment for a Must have GIZMOS review. That’s great if you are product or service I have actually had first hand experience of, but what if you are a company with a new product or service that I’m not familiar with but would like the valuable exposure generated by appearing on MusthaveGIZMOS.com website? The answer is simple, it is a new site launched this week called ReviewMe.com, run by Andy Hagens and Aaron Wall. This new website allows advertisers to get their products or services reviewed by related web sites, and benefit from valuable exposure, feedback, and viral buzz. ReviewMe.com lists each blog an advertiser can have their product reviewed on with a rating out of five stars, this is determined by looking at its Alexa Rank, Technorati Rank, and an estimated number of RSS subscribers. Wedaholic.com is listed within the directory of blogs at ReviewMe.com, just search on the keyword “Technology” to find us. Currently MusthaveGIZMOS.com has a rating of 2 stars, and as a consequence the cost to appear on the site is $60 ($30 is paid to ReviewMe.com and $30 for Wedaholic.com). This way I’m not hiding anything, you can see exactly what I am being paid for the sponsored posts here at MusthaveGIZMOS.com. You get great valuable exposure on MusthaveGIZMOS.com. The rule and regulations at ReviewMe.com state that the post should be a minimum of 200 words. Not a problem with me because I definitely like to write more and add photographs of the product or service. An ethical review of your product or service by our most qualified reviewer. We will end the post with the words “"This is a sponsored review. Please note that this post represents ethical and unbiased review” in so as there is no confusion as to whether I am writing the review out of the goodness of my heart or I am receiving cash for it. This represents a great opportunity for products and services, especially new ones, to receive immediate exposure in front of targeted readers. P.S. This is a sponsored review. Please note that this post represents an ethical and unbiased review. Thanks for the emails and NO I have not stopped posting. I bought a new computer and monitor this weekend and I should have everything loaded and running by Tuesday night. I will update both blogs two times a day from home starting Wednesday. Life is GOOD! I got an HP Pavilion Media Center TV m7680n Desktop with 3.2 GHz Pentium 4 w/HT Technology, 2 GB RAM, 500 GB Hard Drive, LightScribe Dbl layer DVD RW Drive, wireless mouse and keyboard with TV tuner/personal video recording! My dream machine! I also bought an HP F2105 21" LCD Flat Panel Monitor. It has built in Speakers and Micorophone. All this nice equipement deserved a new desk and chair, which I bought as well and converted our guest bedroom into a 2nd office. My wife works from home and has her office. The two offices are conntected via Netgear WGT624 Super G 108 Mbps Wireless Router. You can see all the computer and Monitor details after the jump. I had minor major knee surgery on Friday the 13th. So, I applogize for the lack of posting. Tomorrow Must have GIZMOS will be in up and running. My first impression - It’s fast, slick and stable. Calendar is Ajax driven and, as I mentioned, very fast. Adding an event is as easy as typing “Dinner with Keith tomorrow at 8pm” and Calendar structures the data properly and places a correct calendar entry. This entry can be dragged around the screen to a new day or time. Text recognition - In adding an event, or detecting a new event from Gmail, Calendar automatically detects event-specific words and suggests the adding of a new event with data auto-structured. Manage Multiple Calendars - set up multiple calendars (work, personal, etc) and view them separately or together. Heavy Gmail integration - Gmail recognizes when messages include event information, so when you get emailed about an event, you can add it to Google Calendar with just a couple clicks. Google Calendar links on the right side of the Gmail page. Sharing - Calendars can be shared with others, and you can subscribe to others’ shared calendars. Read/write permissions can be granted on a per user basis. Calendars can be published via a web page or via RSS, so readers do not need to be on the Google Calendar platform. Importing - You can import events from other calendar programs, including Yahoo Calendar and Microsoft Outlook. Click “Settings,” then “Import Calendar”. My overall impression: Excellent. The abilit to share via web publishing or RSS shows Google’s commitment to an open stardard. And this application is impressive in its speed and stability.